"The Weatherspoon Art Museum at The University of North Carolina at Greensboro and Revolution Mill are excited to announce that they have partnered to present a dynamic painting installation by Raleigh-based artist James Marshall (aka Dalek) inside the newly completed Gallery 1250 located at 1250 Revolution Mill Drive. The Weatherspoon Art Museum at The University of North Carolina at Greensboro was founded by Gregory Ivy in 1941 and is the earliest of any art facilities within the UNC system. The museum was founded as a resource for the campus, community, and region and its early leadership developed an emphasis—maintained to this day—on presenting and acquiring modern and contemporary works of art. A 1949 bequest from the renowned collection of Claribel and Etta Cone, which included prints and bronzes by Henri Matisse and other works on paper by American and European modernists, helped to establish the Weatherspoon’s permanent collection. Other prescient acquisitions during Ivy’s tenure included a 1951 suspended mobile by Alexander Calder, Woman by Willem de Kooning—a pivotal work in the artist’s career that was purchased in 1954, and the first drawings by Eva Hesse and Robert Smithson to enter a museum collection. In 1989, the museum moved into its present location in The Anne and Benjamin Cone Building designed by the architectural firm Mitchell/Giurgola. The museum has six galleries and a sculpture courtyard with over 17,000 square feet of exhibition space. The American Alliance of Museums accredited the Weatherspoon in 1995 and renewed its accreditation in 2005 and 2015. The permanent collection of the Weatherspoon Art Museum is considered to be one of the foremost of its kind in the Southeast. It represents all major art movements from the beginning of the 20th century to the present. Of the nearly 6,000 works in the collection are pieces by such prominent figures as Sol LeWitt, Robert Mangold, Cindy Sherman, Al Held, Alex Katz, Henry Ossawa Tanner, Louise Nevelson, Mark di Suvero, Deborah Butterfield, and Robert Rauschenberg. The museum regularly lends to major exhibitions nationally and internationally. 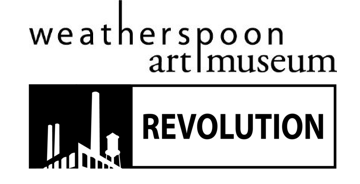 The Weatherspoon also is known for its adventurous and innovative exhibition program. Through a dynamic annual calendar of fifteen to eighteen exhibitions and a multi-disciplinary educational program for audiences of all ages, the museum provides an opportunity for audiences to consider artistic, cultural, and social issues of our time and enriches the life of our university, community, and region."